Line H, opened in December 2016, is currently Medellin’s newest urban cable car. Image by Secretaría de Movilidad de Medellín. In transit planning and city-building circles, Medellin is often regarded as the birthplace of modern Cable Propelled Transit (CPT). Last week, the Colombian metropolis announced that the City will open its sixth urban cable car, Line P, by Q3 of 2019. For those unfamiliar with Medellin, the City’s journey to international superstardom began with the implementation of Line K in 2004. In brief, Medellin’s first urban cable car was met with worldwide acclaim for its remarkable ability to physically and symbolically integrate impoverished and disconnected barrio residents into the city proper. Alongside social infrastructure improvements, the cable car sparked incredible urban renewal efforts where Medellin was transformed from a violent cartel-run city to a vibrant urban metropolis known for its innovative city-building ideas. Line K’s remarkable success led to the construction of subsequent urban gondolas, including the newest CPT system to date, Line H.
Line H became Medellin’s fourth cable car line after it was inaugurated last December. The cable car was built with a capacity of 1,800 pphpd to help improve transportation for the 150,000 residents living in eastern Medellin’s Commune 8. Similar to Line K and Line J, the cable car complements a higher-order rapid transit line — the Ayacucho Tram. The cable car effectively takes riders from the tram’s eastern terminus at Oriente to the Villa Sierra neighbourhood on the hillsides — overcoming an elevation difference of 197m. Medellin Metrocable Line H. Image by Secretaría de Movilidad de Medellín. In the past, there was only one steep narrow road connecting Villa Sierra, but now the gondola provides the community with an alternative five minute ride to the Oriente tram station. Technologically, the MDG system is nearly identical to existing cable cars in Medellin which utilizes 10-passenger carriers built by POMA/Sigma Cabins. At 1.4km in length, Line H is the second shortest gondola line in the City. System characteristics of Metrocable Line H and Metrocable Line M. Image from El Colombiano. Similar to Line H, Metrocable Line M serves the eastern parts of Medellin and is the second cable car connected to the Ayacucho Tram. Originally scheduled for completion in July 2016, Metrocable Line M has faced a number of delays related to complicated geological/structural issues at its Miraflores transfer station. However, these challenges have been resolved and reports indicate that the system is now 70-80% complete. From its bottom station (Miraflores) to its top station (Trece de Noviembre), passengers will travel over 11 towers while experiencing a vertical rise of 275m. Residents are told that the system should be ready for passenger service by August 2018. 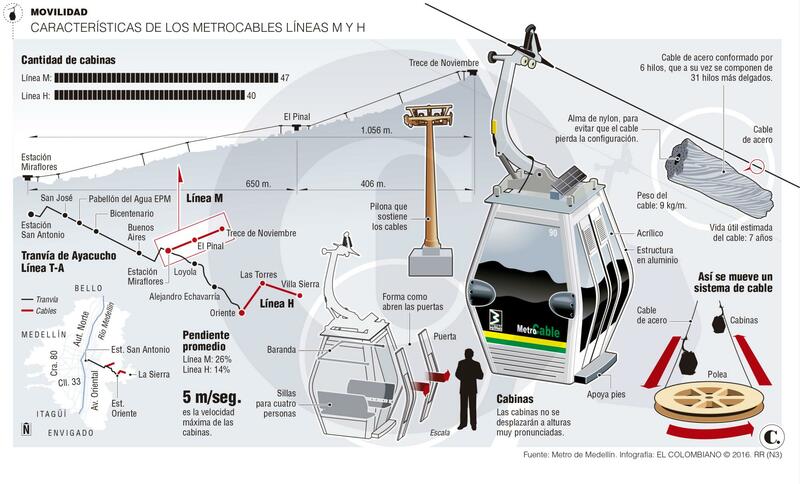 At 1km in length, Line M will be the shortest urban gondola in Medellin. Earlier this year, the government released a tender for Medellin’s sixth urban gondola, Line P. After receiving two submissions, a French consortium was chosen as the winning bidder to construct the US$99 million project (COP 298 billion). Line P will be Medellin’s longest (2.8km) and highest capacity (4,000 pphpd, 127 cabins) cable transit system. Technically speaking, Line L is longer at 4.8km, but it functions solely as a recreational system. With a directional capacity increase of 1,000 pphpd over its cousin systems Line K and Line J, Line P will benefit an estimated 420,000 persons. This capacity increase is designed to serve the northwestern communities including areas considered the most dangerous in Medellin — Commune 5 (Castilla), and Commune 6 (Doce de Octubre). With supplementary social interventions such as 30,000 square meters of new public space, the City hopes to replicate the success it has seen in the Santo Domingo neighbourhood. Officials believe that travel times to the city centre will decrease from 60 minutes today (via two bus lines) to just 15 minutes. Rendering of Acevedo Station – Metrocable Line P. Image from Mayor of Medellin. At its eastern terminus, the 4-station Line P will be connected to the Acevedo intermodal station. Once operational, residents can transfer between three rapid transit lines — Metro Line A, Metrocable Line K and Metrocable Line P. Implementation works are planned for the next 18 months. With six urban gondola lines by the end of 2019, Medellin will have built 14.7km of cable cars spread over 20 stations — making it the world’s second largest CPT network. While that is less than 50% of La Paz-El Alto’s Mi Teleferico (at full build), Medellin’s continued efforts to expand its urban gondola network is equally impressive and noteworthy. Based on operating statistics, the cable cars have been nothing short of success as the combined ridership of Line K, Line J, Line L and Line H have totalled 241 million passengers since 2004 while Line K and Line J operate with an availability of 99.09 – 99.90%! The opening of two additional CPT lines in the next two years will build on Medellin’s past success and will further cement the City’s as one of the leading urban innovators in the new millennium.